Inspired by conversations on the FOOD52 Hotline, we're sharing tips and tricks that make navigating all of our kitchens easier and more fun. Today, we're mastering the art of layer cakes. Have you ever considered buying a pre-made layer cake and pretending you made it? Or maybe you've just written off making them altogether, explaining that you're just "not a baker." We've seen this behavior before, and we're here to tell you that you can do better. And that layer cakes are easier than you think. We asked our friend Dana Loia, owner of Dana's Bakery, to give us a step-by-step tutorial. Now you can have your (perfect) layer cake and eat it, too. 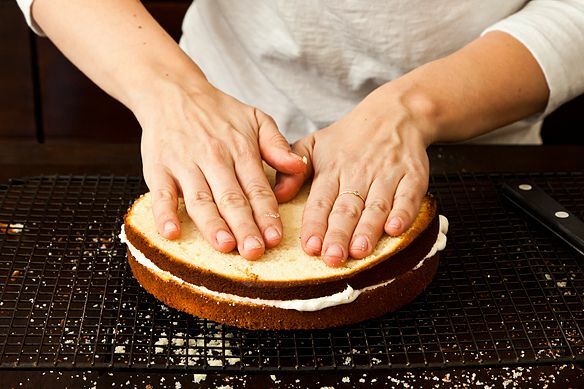 If you've got any other tricks for mastering layer cakes, let us know in the comments! Setting Yourself Up for Success: Line two round cake pans of equal size with parchment paper. Butter and dust them with flour, and gently tap out any excess flour. This process, which may seem tedious, will keep your cakes from sticking to the pan and crushing your dreams. Making the Cake: Follow the instructions for whatever cake recipe you are making (we like this one), and divide the batter evenly between the two pans. Give them a little tap on the counter to remove any air bubbles and pop the pans in the oven (which you heated already, right?). When the cakes are done, remove them from the oven and let them cool to room temp. Removing the Cakes from Their Pans: First, take a deep breath. No need to freak out -- it's just cake. Then, using a small offset spatula or a paring knife, glide it around the sides of the cake to loosen any sticky or stubborn batter from the pan. Wrap a cardboard cake round the size of your pans in plastic wrap and place it on the top of the cake. 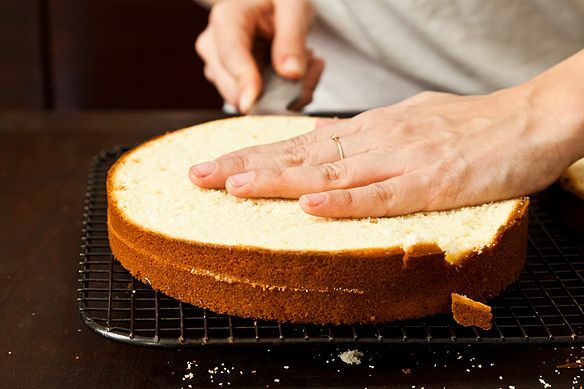 With one hand on either side, flip the cake pan over and gently tap one side so the cake loosens and slips right out of the pan -- don’t worry, it won't break that easily! If you're having trouble getting the cake out, put the pan in the freezer for 10 minutes, then try again. Repeat with the second cake. Chilling Out: Once the cakes have been freed from their pans, place them on a sheet tray or large plate and put them back in the fridge for at least an hour. Chilling the cakes will help prevent breakage and excess crumbling when you cut them into layers. You can also do this the night before and let the cakes chill overnight -- just make sure to wrap them in plastic so they don’t go stale. Cutting the Cake: With a serrated knife, gently cut the dome off the top of each layer. 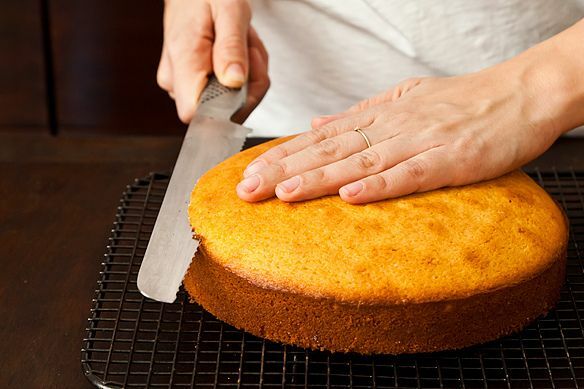 When cutting your cakes, make sure to keep the knife flat -- any angle will result in an uneven layer. Take your handy, plastic wrapped cake round and place it on top of the cake and FLIP! Remove the parchment paper if its still on the cake, and ta-da! The bottom of the cake is now the top, and it's smooth and flat and amazingly even. Making the Layers: Hold the serrated knife in your dominant hand and place your knife on the side wall, halfway up the cake. 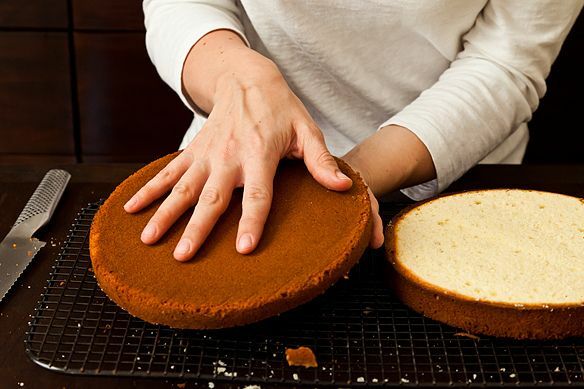 With one hand flat on the top, and your dominant hand holding the serrated knife flat, flat, flat, slowly saw back and forth while turning the cake clockwise with your other hand. 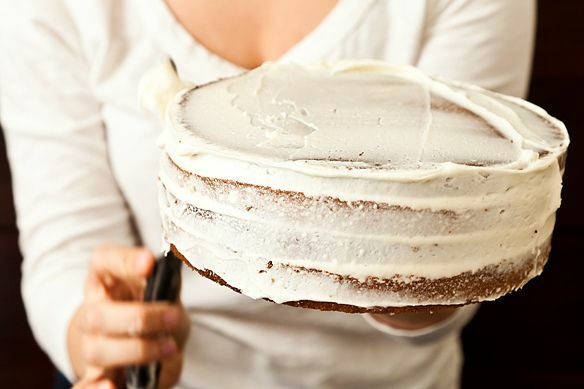 Make sure your cake-turning hand is on the top of the cake, avoiding the possibility of the serrated knife coming through the other side and cutting your hand. Trust me, that hurts. Take a deep breath, you’re doing great! Assembly (Or, You're Almost There! ): Put a dab of icing in the middle of a cake round and place layer one on top. This dab of icing acts like glue, keeping the layer on the cake board. This is now your bottom layer and it's a great place to hide an ugly layer if you had any trouble with your serrated knife. 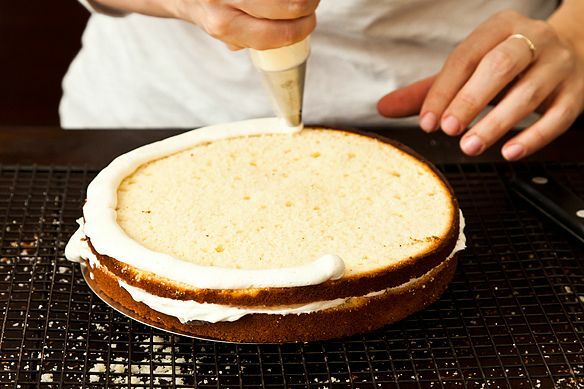 Place a dollop of buttercream or whatever frosting your recipe calls for in the center of that layer. 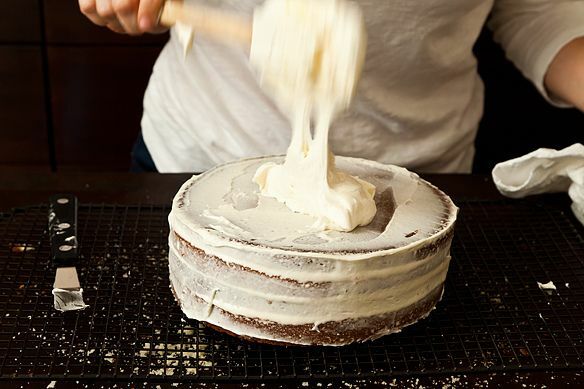 Using an offset spatula at a slight angle, work the icing from center to ends using a half-circle motion. Do this until the icing is in an even layer and coming over the sides. Once the icing is evenly distributed, place new layer on top, and repeat. If you have a “loose” filling like a jam, custard or curd, pipe a line of buttercream around the inside edge of the layer and fill it with the loose filling. This buttercream barrier prevents the filling from oozing out the sides. 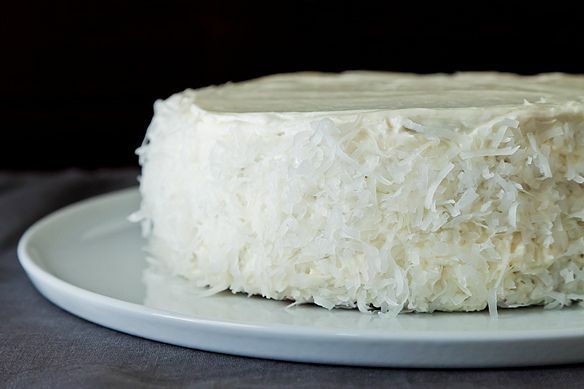 Now that you’ve got the hang of it, assemble all of your layers and make sure to place the flattest layer on the top with the bottom of the cake turned upside down so that the bottom is now the top of the cake. 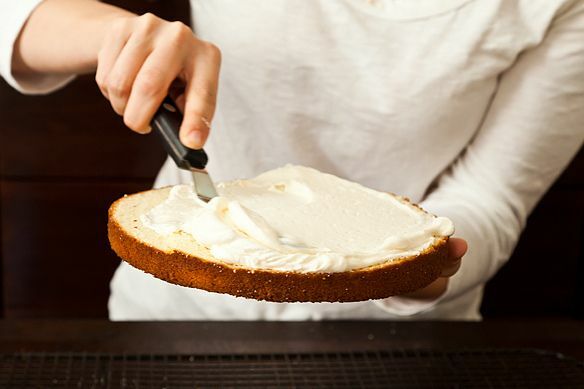 Time to Ice: With a silicone spatula (or a spoon), place a large dollop of icing on the top of the cake. 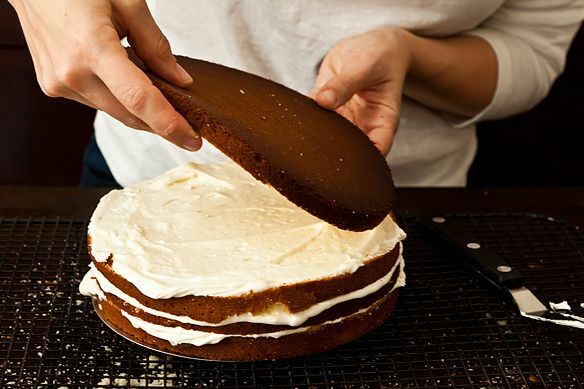 Evenly smooth the icing over the top of the cake with your trusty offset spatula until you are just over the edge. Next, place a small amount of icing on the side wall of the cake and spread it evenly from bottom to top turning the cake towards you. 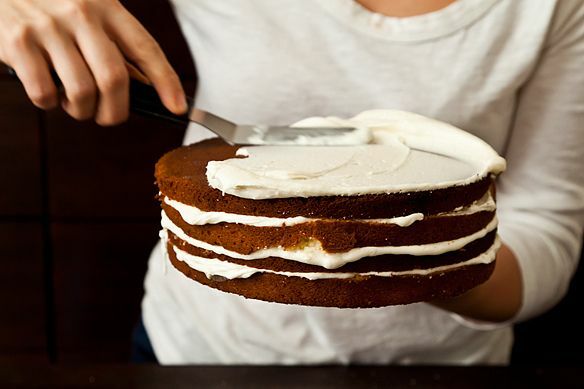 Once the sides are covered, clean your spatula of excess icing and do a once-over to smooth and fill in any uneven areas. 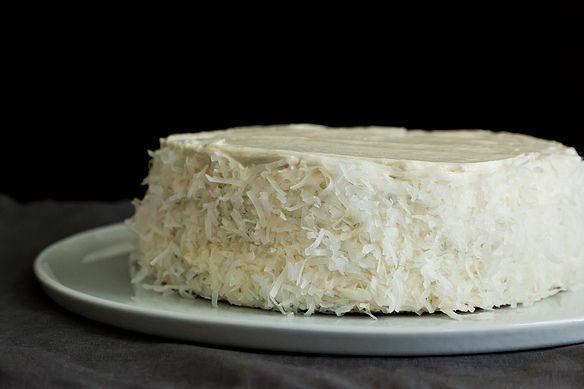 You can add goodies to the side of the cake to hide any imperfections, too -- try toasted coconut or nuts, sprinkles or cocoa nibs. 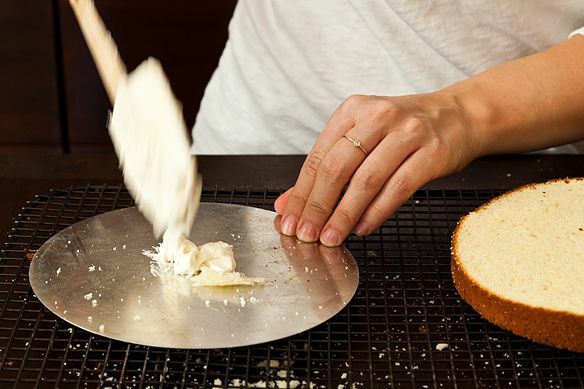 Finishing Touch: If you want that smooth, professional bakery look, take a container deep enough to cover the metal part of your offset spatula and fill it with hot water. Grab a paper towel (any towel will do, but I prefer paper towels because they don't leave any leftover “fuzzies”), and dip your magic wand offset spatula into the hot water and wipe off excess water with the towel. 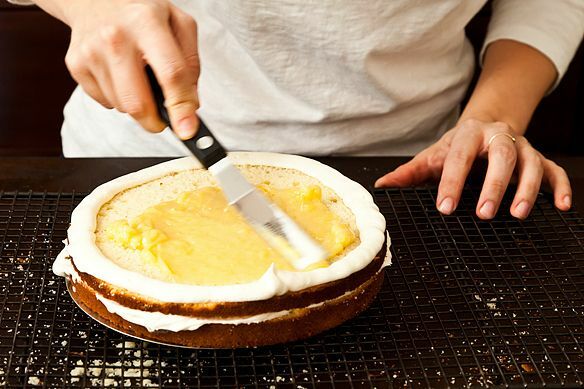 While the metal of the spatula is still hot, gently smooth the blade over the top of your cake at a 45º angle. Like magic, you will see all the lines disappear and will be left with a shiny flat, almost-too-perfect surface. Make sure not to press too hard or you will remove too much icing and need to backtrack to fix it! 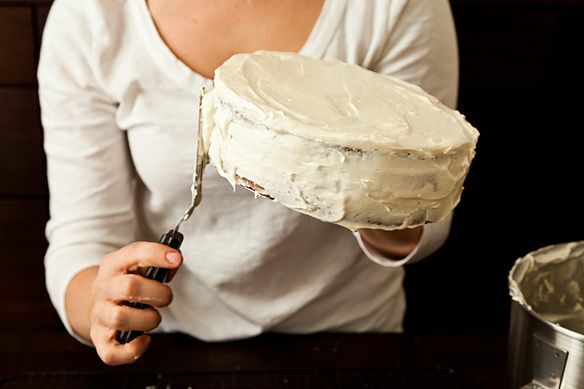 Continue to do this along the sides until the cake is complete, cleaning and reheating your spatula between strokes. And remember: practice makes perfect, so make these often! Photo Editor turned Pastry Chef. Owner of www.danasbakery.com. Bringing you classic French macarons with an American twist!! Check us out at www.danasbakery.com! I tried using a dental floss for my cake and it came out better than the knife method. I have a cake layer recipe and it recommends to not assemble the cake until an hour before serving. Would anything bad happen if I assembled all of it and stuck it in the fridge over night? It's strawberry filling cake with heavy cream frosting. I would make it the day before and freeze it overnight, then remove the layer cake 3 to 4 hours before serving. I have worked in several cake bakeries and they all used this method. If it's fresh strawberries, personally, I wouldn't. I think assembling it a few hours beforehand and putting it in the fridge is fine, but overnight may make it taste more like a trifle. I agree with darksideofthespoon, too; freezing the cake also makes it easier to work with. These tips are all great! If only I had an oven that wasn't such a nuisance and would hold a consistent temperature! I sent this wonderful article to my teenage daughter yesterday when she wanted to make a three-layer cake for her friend's birthday. She dutifully followed the instructions outlined and it turned out great. We approximated a cake board by wrapping a piece of cardboard with parchment paper. Now I need to buy her a "magic wand" for frosting! Another trick for making even layers is by simply baking the cake batter in half sheet pans and cutting out circles or squares after the layers are baked. Less baking time, less stress about cutting even layers. This process eliminates thick over baked tops and bottoms that cake pans often produce. Cooled cakes are key. I have one of those cake slicers but still haven't used it. You're giving me ideas! That cake is so gorgeous. One word of warning if you're not used to baking cakes. Follow the recipe to the letter. Changing up any of the ingredients or not using the right amount of each one can result in failure. I will never forget a friend who was aching to make my Sweet Potato Cake for her dad's birthday. She wanted to prove to her folks that healthy baking could be delicious. The recipe calls for 2 cups of cooked and mashed sweet potato. (I even warned her she would have too much sweet potato after she prepped it, and only to use TWO cups.) Well, she decided to toss the whole thing in, and her cake turned out as dense as lead. Would you believe she called me to ask what might have happened? So please make sure to measure exactly! This is where a bread knife comes in handy. It's the best serrated knife around, but wicked sharp (as my husband's 4 stitches demonstrated). Another reason to use the cake slicer; works great on the cake, but couldn't cut you if you tried. In a pinch dental floss can even be used to split layers. Wrap a piece of unwaxed floss around the layer with a little extra. You can see where the floss will split the layer and move it up or down so the layers are straight. Wrap the ends around your fingers and pull so the floss splits the layer. Nice tute! I decorated cakes for years before becoming a chef and I have two tricks that aren't in here that I think are essential! First, instead of an offset spatula for decorating the sides (after you do your crumb coating), use a metal pastry scraper. That way you can angle the scraper against your cake board so you get perfect straight sides on your cake. The second, which goes hand in hand with the first tip is to purchase a lazy susan from somewhere like Ikea. 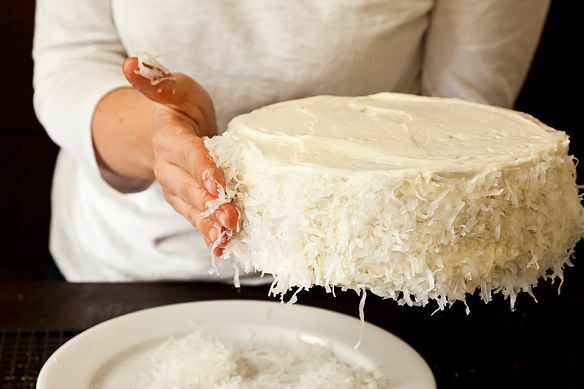 That way you can spin the cake around while you hold your scraper against the cake and get a perfectly smooth icing job with no lines on your cake. Love the lazy susan tip! Genius! That thing looks genius! We're celebrating my mother's 80th birthday while on vacation, and I don't even know if the place will have a serrated knife. Where did you get that?